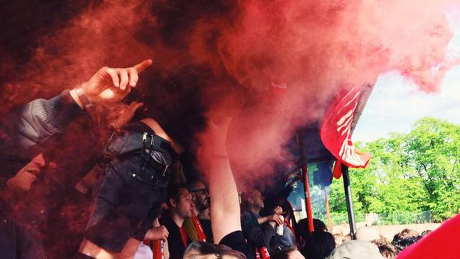 For nearly three seasons the anti-fascist supporters of Clapton FC have been enjoying football with beer, pyrotechnics and an eclectic range of chants, without racism, sexism or homophobia. But the stand the clubs supporters have taken and their community work, which includes supporting the Focus E15 mothers and anti-raids campaigns, has brought them to the attention of the far-right. Several far-right groups and individuals from across the country have come together, vowing to shut down the Clapton Ultras and if that fails, the club itself which was founded in 1878. Clapton Ultras on the scaffold stand at The Old Spotted Dog Ground. The tactics used in the previous campaign, which saw Mangotsfield United FC's 'Inter Village Firm' effectively shut down, haven't worked, so fascists have started turning up at games. Last weekend two fascist attacks were successfully repelled by anti-fascists when clashes broke out at Clapton's away game in Southend, but the fascist groups responsible are vowing to return. 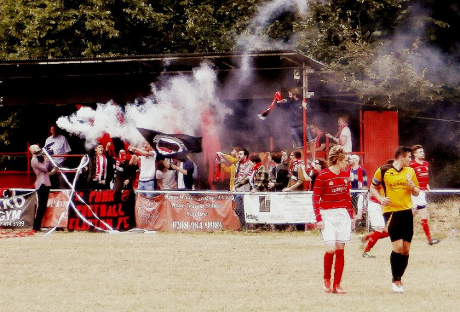 In December 2013, fascists made six complaints to Mangotsfield United FC about the use of pyrotechnics and displaying of political symbols, leading to a ban of both of the club. Fascists had hoped making complaints to the chief executive for Clapton FC, Vincent McBean, would lead to a similar outcome, but McBean has not given in to fascist intimidation. Realising they needed to change their tactics, a number of fascists from across the country travelled to the ground in October this year in an attempt to intimidate supporters. The group visited Nathan’s Pie & Eels on Barking Road, prior to arriving at the Old Spotted Dog ground on Upton Lane half an hour before kick-off. They posed for photographs with a flag outside the ground and put up a racist sticker before police made them disperse and leave the area. Fascists posing outside The Old Spotted Dog Ground. From left to right: Mark Carlton, Dave Clark, Donna Young, Claire Clark, Kevin Layzell, Anthony Carter-Hyam, Martin Jackson, Roy Price, Paul Skinner, Danny Smith and Jay Butler. Afterwards the fascists re-grouped and headed into central London where they carried out attacks on several individuals attending the Occupy event in Parliament Square. 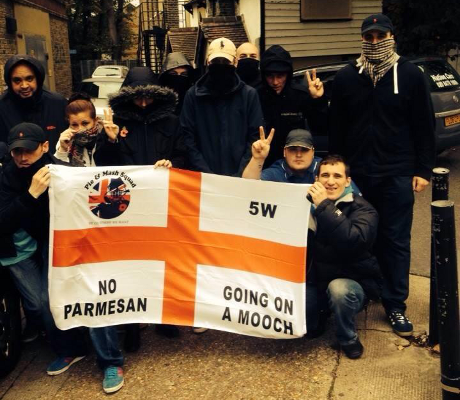 Co-ordinated by the 'Pie & Mash Squad' Facebook page, the fascists present were mainly from the South East Alliance and EDL but also included some ex-members of Casuals United. Last weekend a car load of South East Alliance activists launched a disastrous attack on Clapton supporters going to an off licence during half time at their game against Southend Manor. The altercation ended with chairman for the South East Alliance, Paul Pitt being hospitalised. There was a further bungled attack on anti-fascists in a car-park during the second half, when a seven-seater taxi pulled up containing a group led by a mixed race member of Huddersfield EDL. Posts on the 'Pie & Mash Squad' Facebook page show the group is trying to put Clapton FC out of business by creating a policing bill the club is unable to pay.